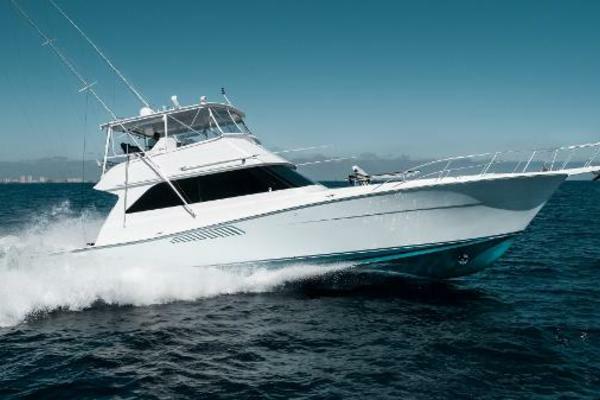 This is a great opportunity to own a very well kept Trojan 13 meter that is the largest 43 sportfish on the market, with a 16.3 beam she has motor yacht room inside with the huge flybridge that has aluminum framed bimini and full enclosure, U-Shaped seating forward with table, wet bar, refrigerator and large cockpit for fishing or relaxing. The inside salon is huge with three steps down to u-shaped galley that's well appointed. Don' t let this one get away. United Yacht Sales New Jersey would love to guide you through a personal showing of this 43' Trojan 13 Meter Convertible 1986. 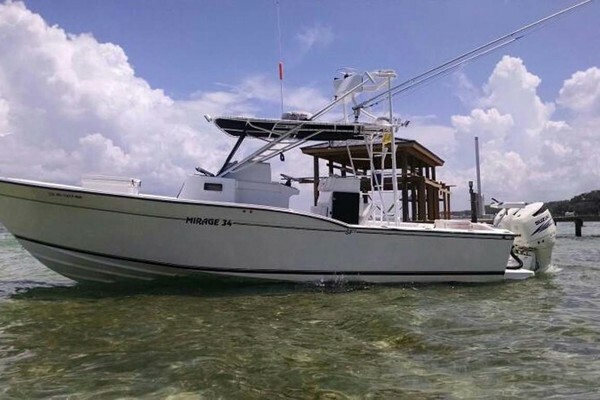 This yacht for sale is located in Merritt Island, Florida and priced at $79,900. For a showing please contact us by filling out the form on this page and we will get back to you shortly! Starting forward in the master stateroom is a centerline queen bed with overhead cabinets and swivel lights, mirrored bulkhead trimmed in wood, teak trimmed counters on both port and starboard. The starboard side has a drawer under the counter and a full-size hanging locker with mirrored door. Overhead lighting and stereo speakers are mounted on the back bulkhead. On the port side is a drawer under the counter, Lunaire Marine A/C digital controls. Moving aft there are two drawers and mirrored doors on a second large hanging locker. Aft of the hanging locker is the door into the port side head with tile floor, one-piece molded marble sink and counter, chrome faucets, under counter storage and above is a teak trimmed mirror/medicine cabinet with overhead lighting and hatch. There is a Vacu-flush head and large walk-in shower with teak grate flooring, acrylic door, large seat and volume storage. Across companionway is the second head with molded one-piece sink and counter, chrome faucets, under counter storage, two overhead medicine cabinets with mirrored doors trimmed in teak, overhead lighting and hatch, walk-in shower with teak grate, chrome faucet and small seat. Continuing aft on the starboard side is the guest stateroom which has a double berth, overhead lighting, built-in nightstand with two drawers and lamp. Forward of the bed is a hanging locker with teak trimmed mirror and Flat Panel TV. Moving aft and up one step into the U-Shaped port side galley with built-in overhead Kenmore convection microwave, princess three-burner electric stove, lots of drawers and cabinet storage, double stainless steel sink with a wood cutting board. Continuing along the counter are large overhead cabinets and under counter Sub Zero side by side refrigerator/freezer. Continuing up three steps into the main salon is a large port side breakfast bar with two stools, an L-Shaped convertible couch that makes into a double bed and sliding glass doors across the back of the salon. On the starboard side of the salon is the AC/DC electrical panel and digital A/C controls. Next is the L-Shaped settee with a glass table. The large windows let plenty of light and allow for great visibility. Owners have upgraded the interior including carpeting, upholstery, cabinets and window treatments. The Trojan 13 Meter International was the beginning of this revolutionary model that ran in production for over a decade. Her wide beam and modified V-hull design gave her great sea-kindliness. The spacious interior with recent upgrades makes this boat a real value for your money.